1. Canine Manners - Bring Your Dog! Does your dog know his basic commands? Does he/she jump on other people? Does your dog nip or mouth you or others? Does he/she bark at you out of boredom or demand? Does your dog pull when on leash? ​This course will prepare you and your dog for successful outings in public and other social settings by teaching you training techniques for common canine issues and giving you a chance to practice them with your dog in the course so you can then go back home and put them into practice in everyday life. This course is NOT for aggressive or reactive dogs. If you have such a dog, please talk to the instructor about other training opportunities. Please note: Course is limited to 6 working spots. Audit positions are available up to 15 individuals. Dogs are masters at reading body language - of their own kind and ours... Are you? Do you know the difference between the various positions of the tail and the types of wags? Do you know what causes the hair on your dog's back to go up and what it indicates? Can you recognize the difference between a dog acting defensively aggressive vs offensively? Find out how dogs communicate with their bodies with one another as well as with us. Learn to recognize not just the obvious signs of fear, anxiety, aggression, and submission, but also the subtle ones that are precursors to reactivity. ​This is a seminar for people, NO dogs please. Do you know what appropriate play looks like? Or the signs of over arousal? And what should you do if the situation turns ugly? ​and safe at the dog park. This is a seminar for people, NO dogs please. You have doggy questions? We have doggy answers! How can I stop my puppy from biting me? How can I teach my adolescent dog not to jump on kids? How can I train my dog to let me clip his nails? Why does my dog pace and whine? What kinds of games can I play with my dog to prevent boredom? Our previous "Ask The Trainer" event was so popular that we opened up another one. This event offers pet owners the opportunity to ask our trainers about their canines, whether it's challenging behaviors like mouthing, jumping or information on wellness and training. This is a FREE public event with limited space, so please register to reserve your spot. This is a Q&A event for humans only! Please leave your pets at home. Confidence building happens now! Not later in a dog's life. No need to be concerned about your puppy catching a disease in class. Not only do we check all vaccination records to ensure that all the puppies are current on age-appropriate shots, but we also regularly clean our facility with the same type of cleaning solution that is used at Vet offices to prevent the sustenance and spread of illnesses. Prevent Fearfulness from Developing! Fear of strangers and/or unfamiliar dogs; Fear of thunder and/or fire works; Fear of new, odd objects, places... These are all too common forms of fear that develop in dogs due to inappropriate or lack of exposure and socialization at an early age, that is before 16 weeks of age. We will create a version of these scenarios in class to teach you how to work on preventing and minimizing fear in your puppy, as well as what to do should you see them acting afraid. Click for Article: "Can You Reinforce Fear?" Prevent Vet and Grooming Stress! Don't be fooled by your puppy's seemingly calm, non-reactive response to being handled, poked and prodded. By the time your puppy is due for his/her 3rd round of shots, they'll be mentally more aware, physically more balanced and strong, and emotionally more sensitive. That means that your puppy will now start to express his feelings about things that bother him/her more openly, aka resist what doesn't feel good! Early "husbandry" training can reduce aversion and resistence to being handled, especially for veterinary and grooming care. Even the Veterinary world is moving toward creating a "Fear-Free" environment for our pets. 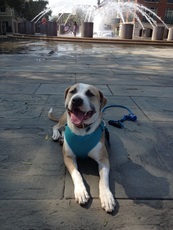 We will be contacting your Veterinarian to confirm that your puppy is current on age appropriate vaccinations. Note: Classes require a minimum of 3 registrants to be held. In the event that a class is missing the required number of participants, it will be pushed back 1 to 2 weeks to a new start date. Students already registered will be informed via email. ​Polite Behaviors: To have a well-mannered dog, it's important to start training young to build the puppy's repertoire of desirable behaviors. Problem Behaviors: We will discuss solutions for challenging puppy behaviors such as housetraining, crate training, nipping, jumping, & more. Playtime Socialization: Puppies will have a chance to socialize & build their canine communication skills via playtime at the end of class. *We offer 10% discount on this class to individuals who have adopted a dog in the last 3 months (of the class start date). Proof of adoption and date will be required. First class is a mandatory orientation for pet owners without dogs present. Please note: We will be contacting your Veterinarian to confirm the status of your dog's vaccinations. Don't let your puppy loose out on earning his/her first AKC title & medallion! Skills your puppy will learn include sit, down, stay, come, relax on mat, heel position, changes of pace, & more. Learn how to work on building your pup's confidence through correct socialization techniques. Get tips on how to successfully address issues like puppy biting/nipping, jumping, barking, crate training, & more. At the end of the course, we will administer the AKC S.T.A.R. Puppy test. Upon passing the test, you'll be eligible to enroll in the AKC S.T.A.R. Puppy Program & receive the AKC S.T.A.R. Puppy Medal (for display or memento purposes). Ongoing Monthly Email Newsletter: Your AKC. This includes training tips and up-to-date information every dog owner needs to know. Classes require a minimum of 3 registrants to be held. In the event that a class is missing the required number of participants, it will be pushed back 1 to 2 weeks to a new start date. Students already registered will be informed via email. Practice what you've learned outdoors at locations around town. This is an ​advanced class for dogs that have completed an adult manners &/or obedience course. The purpose of the class is to proof previously learned behaviors - such as sit, down, wait, leave it, leash walking - in the presence of public distractions. Each class will be held at a different location around town as determined by the instructor. Please note, this class is NOT for aggressive, reactive, or fearful dogs. Please consult with the instructor prior to sign up if you are unsure. 5 week class includes orientation, $110. BASIC LEVEL: Geared toward dogs with no prior formal training as well as those in need of a refresher. 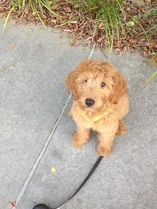 Cues (aka commands) will include sit, down, wait/stay, come, leave it/drop it, leash walking & more. Please NO aggressive or reactive dogs; consult with the instructor prior to sign up if you are unsure or to inquire about about other training options. We will be contacting your Veterinarian to confirm the status of your dog's vaccinations. You’ve taken a basic manners or puppy class. You got a good start but now what? Well, here’s one good answer: the Canine Good Citizen program. As the American Kennel Club puts it: “Responsible Owners, Well-Mannered Dogs. The AKC's Canine Good Citizen program is recognized as the gold standard for dog behavior. In CGC, dogs who pass the 10 step CGC test can earn a certificate and/or the official AKC CGC title” (from the American Kennel Club site). Why? The CGC is recognized in more than 40 states and nationally as an indicator of a well-behaved dog (think landlords &/or insurance). It is often a first step toward other activities such as therapy work or contraband detection and the more obvious obedience, rally, and agility. Who? Any dog, of any age, can earn a CGC. Before starting the class, we recommend that your dog is familiar with sit, down, stay, come, and walking on a leash. Though the actual skills may still be a work in progress, we will help you get from that “work in progress” stage to the level required to pass the AKC test. Daytime class - Taught by Sue Krom, a CGC Evaluator and member of the National Association of Dog Obedience Instructors (NADOI). Evening class - Taught by Caroline Hunt, a CGC Evaluator for more than twenty years and a member of the National Association of Dog Obedience Instructors (NADOI). The evening class includes AKC tricks training as well, which increases rapport between dog and handler. Most students achieve the Novice Trick Dog title along with the CGC. Where? 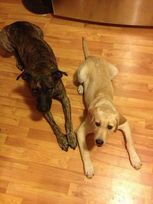 For facts about the test and the CGC program, go to the American Kennel Club web site (http://www.akc.org/dog-owners/training/canine-good-citizen/). To find out more about the class, email Sue Krom for the daytime class (suekrom@comcast.net) and Caroline Hunt for the evening class (rallytrainer@gmail.com). Looking for something fun to do with your energetic, athletic dog? Agility is a great way to exercise your dog's body & mind, while building up their confidence. 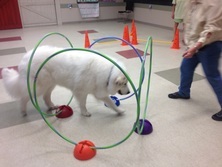 From the tunnel & weave poles to the tire & jumps, learning to work together as a team in performing the agility obstacles contributes to forming a better, trusting relationship between you & your dog. This class is for pet-dog owners who are looking to provide stimulation & enrichment for their dogs; it is non-competitive. Space is limited to 6 dogs, on a first-come first-served basis. Dogs must be friendly toward people & other dogs. Classes require a minimum of 3 registrants to be held. In the event that a class is missing the required number of participants, it will be pushed back 1 to 2 weeks to a new start date. Students already registered will be informed. If your dog is not good with other dogs or is too nervous in a group setting, you can still take the class by scheduling a private session for just you and your dog. 45 min. private session, $40. An obedience venue that allows purebreds, mixed breeds, and even dogs with disabilities to compete and “strut their stuff" in the ring, the CDSP program is based on dog‐friendly training methods, allowing handlers to communicate with their dogs throughout. There are 5 levels in the CDSP program: Starter Novice, Novice, Open, Utility, and Versatility. In the Novice levels, skills learned include: On-leash Heeling and Figure 8; Off-leash recall and recall over a jump; Sit/Stay and Down/Stay. In the Open levels, skills worked on include: Broad jump, down on recall, retrieving and Sit/Stay at a distance. In the higher levels, dogs are taught discriminative skills and off-leash behaviors while handlers work on incorporating hand signals into their training exercises. Dogs that pull make walking unpleasant and frustrating. You've tried a few of the "no pull" equipment on the market but none have really worked. That's because you haven't addressed the real problem... dog's lack of training and self-control. This class focuses strictly on giving you the tools and knowledge you'll need to teach and communicate to your dog 'where' (position) and 'how' (what speed) you'd like them to walk. During class practice, there will be no greeting between dogs. For greeting other dogs calmly on leash, please see our "Polite Greetings" class. ​Classes require a minimum of 3 registrants to be held. In the event that a class is missing the required number of participants, it will be pushed back 1 to 2 weeks to a new start date. Do you have an overly friendly, easily excitable dog who has trouble containing his enthusiasm in the presence of other dogs &/or people? When you have a dog straining at the end of his/her leash, the chances of that greeting going well is slim. In this class we will work on arousal control to help your dog stay focused & connected, be able to follow requests, & greet people & other dogs appropriately. Owners will learn valuable leash skills, how to identify their dog's early signs of arousal, & practice being ‘proactive’. Dogs should know: Sit, Down, Stay/Wait before starting this class. This class is NOT for aggressive, reactive, or fearful dogs. Please consult with the instructor prior to sign up if you are unsure. This class is geared toward adolescent dogs in need of a refresher course in manners, & training in arousal & impulse control. Exercises will focus on durational positions, relaxation techniques, & play as a constructive, educational tool for the dog. Wag It Games® makes use of elements from popular canine sports such as agility, rally obedience, nose work & others to make training, learning, & performing fun. In addition to enhancing obedience skills, building focus, motivation, & confidence, it also aids in strengthening the dog-owner relationship by promoting cooperation & collaboration. It is particularly beneficial for shy dogs, dogs in need of mental stimulation, & senior dogs who need a low-impact activity. Shadow Skills – obedience exercises with a fun twist. Obstacle Skills – mastering tunnels, hoops, cavaletties & other contraptions. Scenting Skills – utilizing the canine olfactory sensory input to sniff out the hide. DO IT FOR FUN, DO IT FOR COMPETITION. Whether you’re looking to compete in a dog sport - some of our students have already titled their dogs in Novice and are working on their Advanced and Excellent ribbons - or further your dog’s obedience skills, Rally Obedience is the place to start. 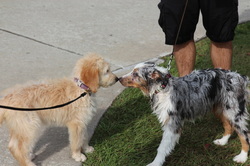 ​Rally Obedience is a popular choice among both competitors & pet owners alike. Most dogs need a job in which to apply their energy and skills. In the absence of such an opportunity, dogs create jobs for themselves - herd the kids, chase away anyone that comes to the house, shred all tearable items, etc. Rally obedience is just that, an opportunity for dog/owner team to engage in a mutual task, one that fosters good communication while building advanced obedience skills. Novice Level/Intro to Competition Rally: For pet owners interested in pursuing Rally Obedience as a sport & considering competing. This class is suitable for both beginners & for those with some rally experience. Intermediate, Advanced & Excellent Levels: For new & returning students who are competing. Rally classes vary in length, from 6 weeks to 8 weeks. Please inquire with your class instructor for the length of the course you are taking. Novice, Intermediate, Advanced, & Excellent Levels are all taught by instructor Caroline Hunt, an experienced competitor who has a Rally Master and multiple RAEs on several of her dogs. Dogs are natural born scenters, it's how they explore and experience their world. So why not take advantage of this self-rewarding olfactory ability and channel it into a fun, constructive game that not only gives the dog a low-key occupation but also provides him with mental enrichment? We don't need to teach dogs "how to" scent, just the rules of the game. That's why dogs of any age, from puppies to seniors, can participate in this class. Senior dogs in particular would benefit greatly from doing scent work as it presents no risk or challenge to the dog's physical condition. Coming when called is one of the most challenging yet necessary & desired behaviors to teach our dogs, not only because the world outside is full of distractions, but it’s also full of extremely enticing rewards, rewards that are not always in our control. This class is held in a confined space & focuses on teaching the foundational behaviors for a reliable recall. Classes require a minimum of 3 registrants to be held. In the event that a class is missing the required number of participants, it will be pushed back 1 to 2 weeks to a new start date. Please hit 'Submit' to fill out our class questionnaire. Only students who have taken Level 1 may register for this class. If you have not taken Level 1 with Z&E Canine Manners, but have attended obedience classes elsewhere and feel your dog’s training level is appropriate for Level 2 class, please speak with the trainer before signing up. Classes run for 60 minutes. This class is limited to 4 dogs and their owners. Week 1 will consist of a review of Level 1 exercises. Provides your petite pal with a more conducive learning environment by taking into consideration the differences in small dog behavior, response, & learning style. Please bring a copy of your dog’s vaccination records to the orientation. Kids in particular enjoy attending tricks classes as they can teach their dogs cool behaviors that they can later show off to their friends. These individual play group classes are designed to give puppies the opportunity to play & socialize in a safe, comfortable environment while helping owners learn about dog play behavior – what is appropriate play, what are canine communication signals, when should an owner intervene, & more. Dogs must be current on all age-appropriate vaccinations.